Once you have members added to your organization either by manually adding their profiles or importing under the Directory tab or having them go through registration, you can start assigning them to teams. Members won’t see anything when they log into their TeamSnap account until they are assigned to a team. Note: Filters are currently AND conditions only. There are no OR conditions built into the filters at this time. So for example, adding filter If Grade Level Is 5th grade and then also adding filter If Grade Level Is 6th grade in one search, the system will not return all registrants marked as 5th OR 6th grade. It will search and return results for those who are marked as both 5th AND 6th grade, which is not possible since registrants can only choose one grade during registration. It is highly recommended that you use a field only once per filter. Currently, saved filters will only be accessible in the browser they were originally saved in. Saved filter searches will not be available in other browsers or devices. 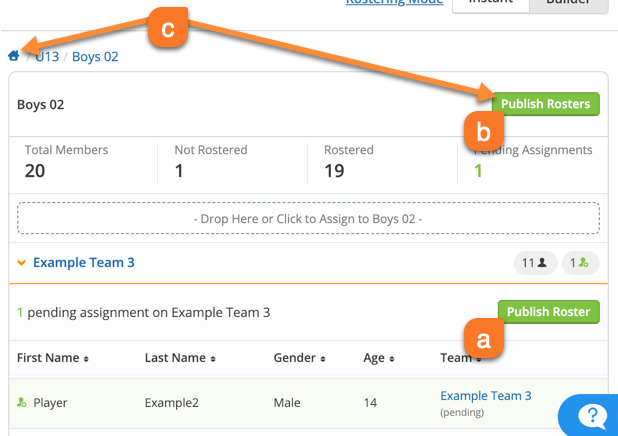 Once rostered, the TeamSnap member who completed the Registration form under their account will automatically have access to the team their registration participant has been rostered to. On the team roster, their active access is indicated by a green checkmark next to their name in the roster list. Note: Additional contacts added to a registration will receive email messages, but will not have access to the team until they have been invited to join. The invitation can be sent by the primary account holder (the person who completed the registration) or an administrator for the team or organization by clicking the Invite to Join button next to the contact's name under the member roster profile. Ready to publish your builder mode roster assignments? Now that you’ve got your members added, rostered, and notified, we’re ready to go over member types.